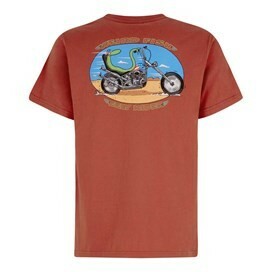 Wear our new Eely Rider Artist T-shirt and head out on the highway with Wyatt and Billy. Yes you can now celebrate the iconic film with our latest addition to our ever growing range of Weird Fish Artist T-shirts. This exclusive design for Weird Fish is a limited edition cotton Artist T-Shirt by Richard Skipworth. It's available in a variety of colours and features the ‘Eely Rider’ print in large on the back with a smaller version on the chest. So funny and most excellent illustration! Great Christmas gifts - so funny! !